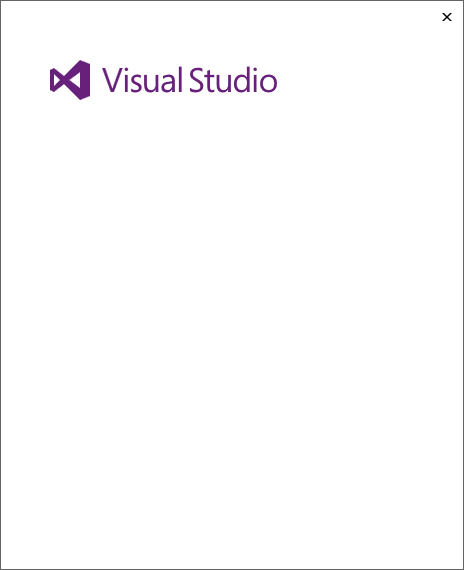 For the most part, I love Visual Studio, but some weeks I hate it very deeply :-). In its current incarnation VS 2015, but also from its origins in VS.NET 2002, it is such a huge piece of software, composed of so many parts, that it’s quite fragile and not very resilient. Microsoft knows it and so it recommends to install betas and previews on non-production machines, that is, on virtual machines. Also, it is painfully slow to install unless your computer is fast and has a SSD. The other day I created a Hyper-V virtual machine on the Surface 4 Pro that I use at work to install VS “15” Preview 5. I don’t know how it happened exactly: I think that I deleted an existing Hyper-V virtual machine with the Visual Studio emulator for Android that I installed days ago for a Xamarin course and that I had to uninstall because in turn I had uninstalled Xamarin because it slowed my VS 2015 startup quite noticeably and Xamarin projects took minutes to create using the New Project menu (I want to love Xamarin, so I will use Xamarin Studio on my Mac). Anyway, my Surface laptop suffered a horrible BSOD at startup (APC_INDEX_MISMATCH or similar). Update Nov 9, 2016: The BSOD crash APC_INDEX_MISMATCH was caused by an update to the Trend Micro Antivirus+ 2016. The solution is to update to Trend Micro Antivirus+ 2017, as explained in their web page Getting stuck on Windows Startup Repair after updating Trend Micro Security. That will launch Visual Studio and will create the log on your desktop (by default Visual Studio would create it on another location). 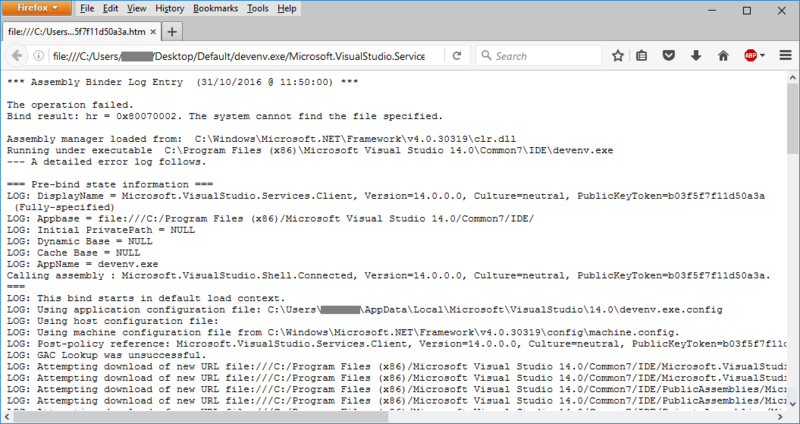 Close or kill Visual Studio and two files should appear on your desktop: MyVsLog.xml and ActivityLog.xsl. 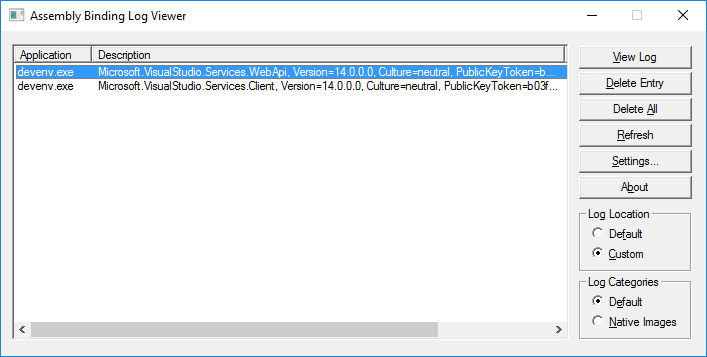 Could not load file or assembly ‘Microsoft.VisualStudio.Services.Client, Version=14.0.0.0, Culture=neutral, PublicKeyToken=b03f5f7f11d50a3a’ or one of its dependencies. The system cannot find the file specified. 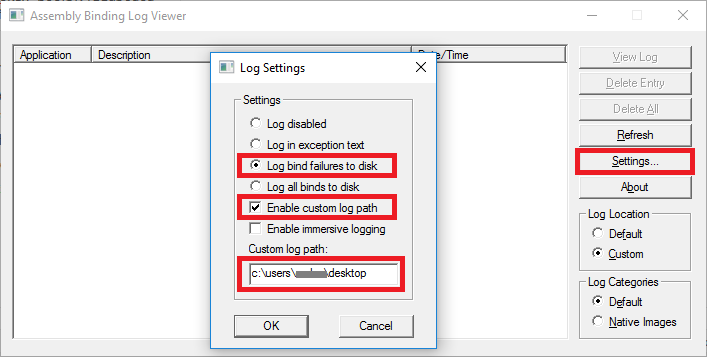 Important: do not forget to click the Settings button again and select the “Log disabled” setting. So, using any of these approaches I know now that my Visual Studio installation doesn’t have the assemblies Microsoft.VisualStudio.Services.Client.dll and Microsoft.VisualStudio.Services.WebApi.dll. I haven’t solved the problem yet (the repair option of Visual Studio doesn’t reinstall them) but at least I have more information. Same here. Frantically removed nearly everthing that has “14.0” and “Visual Studio 2015” in its name, removed registry keys, tried installing Visual Studio using the iso file countless times, checked the sha-1 checksum of the file and found out it was perfecly valid, but gave up and tried the web installer anyway. Nothing (reinstall, repair launching using flags) helped. Have you found any solutions? Nope. I was unable to recover VS 2015. In my case it is convoluted because of the fact that my Surface laptop crashes from time to time at boot time and I need to go back to a restore point in the past, which destroys any fix that I could have found. So, I am waiting for VS “15” to become RC or RTM to reinstall the whole laptop. So I’ve been experiencing this exact same issue. I had tried literally everything and was about to reinstall windows, when I got around this issue. Thanks to your debugging tools in this post I was about to figure out which assemblies I was missing, I would then go ahead and manually download the dlls and place them in the assemblies folders. Although it working, this isn’t a good solution and still am considering reinstalling windows. I decided to give it a try. It removed everything from previous installations, and after that I just reinstalled VS2015, and it worked just fine. I tried virtually all of the suggested fixes… my head was spinning. For me the problem ended up being more of a connect the dots thing. Here is my tale of woe as documented in my daily scratchpad. What an incredible pain in the you know what!!! I think I finally figured out the problem (VS2015 show splash screen and then stops). See the machine.config setting… legacyCasPolicy. A couple weeks back, I began working on a ticket for a bug in a legacy Windows Forms application. The app is pretty old stuff… the app was originally built with VS2008…. I upgraded it to VS2010 about 7 years ago. I needed to locate the form that triggered the offending logic and the best way was to get a look at likely form candidates was using the form designer. I discovered that the VS2010 form designer had issues with the DevExpress ActiveX control suite that the app’s forms contained. I wrestled with VS2010 before discovering a workaround… this machine.config setting….legacyCasPolicy. Now… this setting was no panacea. It presented some flaky behavior in VS2010. When toggled on… I could use the forms designer…. but could not get anything to build. When off…I could build… but not view anything in designer. Plus… to toggle the setting…. this also involved stopping/starting VS2010. Ok… clunky… but manageable. While trying to solve this issue with not being able to run VS2015…. It occurred to me after literally dozens of cycles of install repair/ retry…. 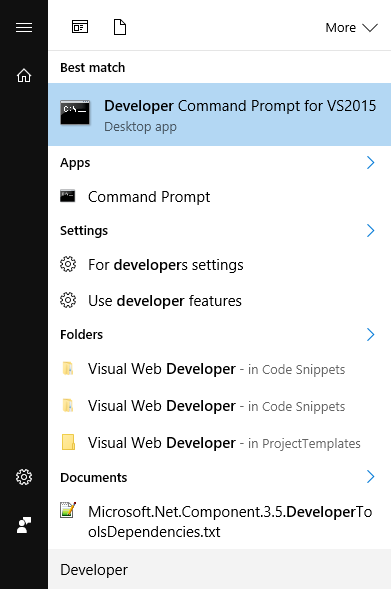 uninstall this or that including VS2015/retry…. 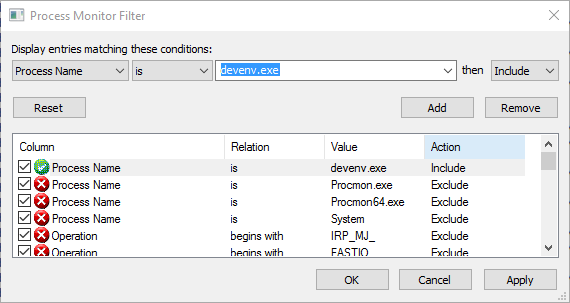 that this machine config setting might be playing a role in the inability to run VS2015. Sure enough! I had left the setting toggled on and after turning it off VS2015 ran fine. Now that all my third party tools have been uninstalled and my VS2015 environment basically trashed. I think I can recover…. but WOW! Glad it occurred to me that the dots might connect.